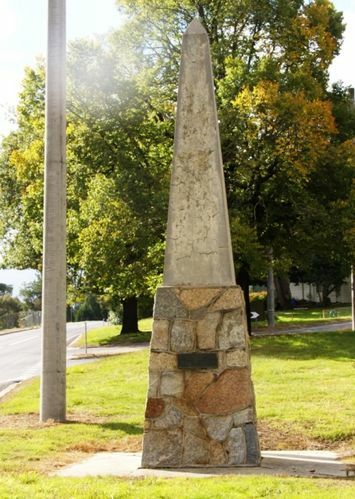 A monument commemorates the discovery of gold in Beechworth in February 1852. In February 1852 gold was discovered at Spring Creek, Beechworth. Within eleven months of this discovery, over 8000 hopeful prospectors had descended on the region, transforming the remote and rugged area into a thriving regional centre. The wealth from the Gold Rush built Beechworth and the nationally significant buildings that still stand. By 1857 more than 20,000 people lived in Beechworth, and with this influx the town prospered with the building of numerous churches, banks, schools, shops and hotels along with a prison and hospital. Nearby Spring Creek, And Approx.